Kansas City, Kan. – Today’s Price Chopper 400 at Kansas Speedway is the third of the 2009 Chase for the Sprint Cup Championship, but it’s the first at the type of track which is the most prevalent in the 10-race playoff. Kansas Speedway is an intermediate. It’s 1.5 miles around and it’s moderately banked. It is, that is, similar in drivablility to four other tracks at which Chase races will be held – California (2 miles around), Lowe’s, Texas and Homestead-Miami. As a prototype of what’s to come, Kansas is attracting a lot of attention from drivers and teams. Greg Biffle: To be perfectly honest with you, I was more looking forward to Dover than here – simply from the fact that if you look at my last three finishes at Dover – a third, a win and a third, and leading the race in the spring with five laps to go – I felt like a left a little unfinished business, you know what I mean? And so it was disappointing to go there and finish 13th – really disappointing. Mark Martin, who came out of retirement to join Hendrick Motorsports this season, started the Chase as this year’s top seed on the strength of four victories during the 26-race “regular season.” Martin has never won the NASCAR Sprint Cup title; he has finished as the series runner-up four times. Now, after winning the first Chase race at New Hampshire and finishing second at Dover, he takes a 10-point lead into Kansas over three-time defending series champion Jimmie Johnson, who won at Dover and is seeking an unprecedented fourth-straight title. Juan Pablo Montoya finished fourth at Dover this past Sunday and moved up to third in the series standings, only 65 points behind Martin. The former Indianapolis 500 champion and Formula One star is in the Chase for the first time. Four-time NASCAR Sprint Cup Series champion Jeff Gordon won the series’ first two races ever held at Kansas Speedway, in 2001-02. Gordon needs to turn back the clock; he’s eighth in the Chase standings, 122 behind Martin. Tony Stewart led the NASCAR Sprint Cup point standings after 26 races were complete, then started the Chase as the second seed, 10 points behind Mark Martin. Two races into the Chase, Stewart needs to start rallying. He comes to Kansas fifth in the standings, 106 points behind the leader, Martin. 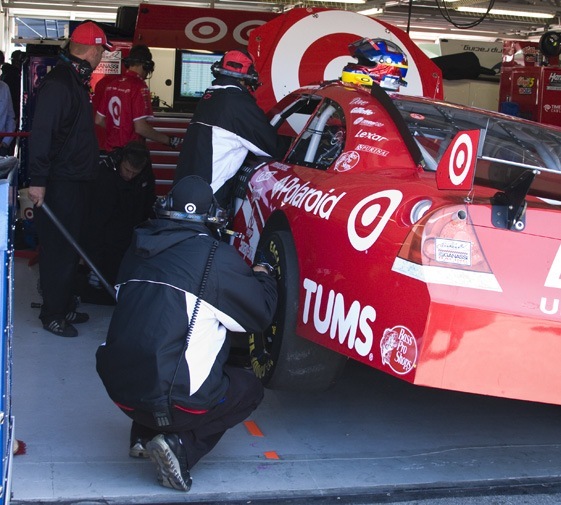 Kansas Speedway is considered the “home track” for two drivers – Columbia, Mo. Native Carl Edwards and Emporia, Kansas native Clint Bowyer. Both would love to win Sunday, especially considering their respective frustrating seasons. Edwards is in the Chase but falling out of championship talk; he comes in this week 11th in the points and still winless in 2009. Bowyer is 15th in points. Edwards, the runner-up in last year’s final series standings, lost a monumental battle with Johnson last year at Kansas, trying a dramatic last-lap, low-dive pass that worked briefly but resulted in Edwards sliding back up high and hitting the wall. Bowyer may be out of the Chase but that doesn’t mean he should be considered out of contention for a race win at Kansas. Three of those 11 have come at Kansas. Depending on the outcome of Sunday’s Price Chopper 400, Chevrolet could clinch the 2009 manufacturers’ title this weekend at Kansas Speedway. If so, it would be the 33rd such title for Chevrolet and the seventh consecutive one. The manufacturers’ championship debuted in 1950. What’s necessary for Chevrolet to clinch: Chevy’s top-finishing driver on Sunday must finish ahead of Toyota’s top-finishing driver. Office Depot and Tony Stewart joined the Office Depot Foundation on Wednesday to donate more than 2,200 backpacks to Kansas City-area nonprofit organizations and schools. “Back-To-School Backpack Celebration,” happens at 4 p.m. CT at the Office Depot store at 4851 North Oak Traffic Way in Kansas City. Guest included Kansas City mayor Mark Funkhouser and Shawna Searcy, Clay County Field Representative for Congressman Sam Graves. Auto Club Speedway hosts the fourth race in the 2009 Chase for the NASCAR Sprint Cup — the Pepsi 500 — next Sunday, Oct. 11 (3:15 p.m. start on ABC). Jimmie Johnson is the defending winner and polesitter. Johnson is tied with Hendrick Motorsports teammate Jeff Gordon for most wins at Auto Club (three). Kurt Busch leads all drivers with three poles there. Gordon and Johnson share another track mark — the most top fives (eight). But Roush Fenway Racing’s Matt Kenseth (No. 17 DeWalt Ford) has the most top 10s there, with 10.